Chester: Lynch, Halls, Astles, McCombe, Rowe-Turner, Mahon, Chapell (Akintunde 65), Joyce (Waters 65), James, Turnbull (Crawford 88), Dawson. Subs not used: Davies, Shaw. Macclesfield Town: Jalal, Fitzpatrick, Lowe, Marsh (Wilson 78), Durrell (Baba 78), Kennedy, Hancox, Yates, Toure (Richards 78), Burgess, Whitaker. Subs not used: O’Brien, Arthur. Chester’s euphoria at an unlikely victory at Aldershot on Saturday was not allowed to endure as they were brought back down to earth on this Bank Holiday Monday by Cheshire neighbours Macclesfield. It was hard to see how another win might be secured with all four strikers side-lined through injury. Jon McCarthy stuck with the eleven that finished the match against the Shots with the exception of goalkeeper Conor Mitchell who was away on international duty with Northern Ireland. Alex Lynch replaced him. Akintunde, one of the inured four made it to the bench, as did assistant manager Tom Shaw. The Silkmen settled first in the warm and sun-soaked Swansway stadium then City retaliated with a couple of crosses which threatened – one from either wing. But Macc broke swiftly and with three or four passes were in the penalty area. Tyrone Marsh span and crossed and Mitch Hancox had timed his run perfectly to glance a header into the far corner. The Blues were facing an uphill struggle after only eight minutes. Perhaps jaded after the exertions on Saturday – Macclesfield, having played on Friday had had an extra day to recover – Chester seemed second to every ball and were crowded out in possession Macclesfield’s high press forced City to hit the ball long and, despite valiant efforts from Dawson as makeshift centre forward, it couldn’t be made to stick. Mahon had an effort well wide from distance but City did not create many clear chances. The same could be said of the visitors too until Toure headed over from close range when he should have scored and then, just before the break Durrell dispossessed Rowe-Turner and cut to the by-line, only for Turnbull to intercept and clear his cross from in front of the goal. City upped the tempo slightly after half time and began to show encouraging signs. Dawson had a shot well-wide but Kingsley James, playing in a more forward role, cut in from the left and fired a shot on target which was beaten away by Jalal. But Macclesfield won a couple of corners following Rowe-Turner’s booking for fouling Toure. The visiting fans were giving their former captain Andy Halls dogs abuse as he lined up in front of them to defend it. Durrell’s kick from the left was swept in to the roof of the net by defender Kennedy and the Silkmen had doubled the advantage. In a seemingly desperate last throw of the dice Chester brought on Matty Waters for Joyce and Akintunde for Chapell and re-arranged to throw Astles up front and move Dawson back in to midfield. Waters filled in at left back and Rowe-Turner moved inside to centre back. Astles got the crowd going for a while with some deceptive footwork and shielded the ball well. City began to look a little more threatening but equally insecure at the back as Macc broke quickly. Mahon saw half-hearted appeals for a penalty waved away and then shot too high after a mazy run. James might have scored a couple of times near the end. First he anticipated Mahon’s lofted pass and beat Jalal to it only to lift the ball over the bar as well as the keeper. Then he didn’t connect well enough with Dawson’s superb free kick and headed wide. Macclesfield too had chances to make the win more emphatic but Marsh headed against the bar and Hancox burst through only to shoot over. Chester had wilted in the sunshine. By contrast the Silkmen seemed to have more energy and organisation. Chester must hit the road again to struggling Torquay at the weekend and then the re-arranged game against Solihull Moors on Tuesday. Had the latter gone ahead as planned then City may well have got off to a flying start and the resulting momentum led to a much more positive start to the season. On such fine lines does confidence and anxiety balance. Aldershot Town: Cole, Alexander, Oyeleke, McClure, de Havilland, Okojie (Rendell 70), Kellerman (Fenelon 70), Rowe, Arthur (Arnold 78), Reynolds, Taylor. Subs not used: Lyons-Foster, Smith. Chester: Mitchell, Halls, Rowe-Turner, Astles, McCombe, James, Turnbull, Davies (Joyce 46), Mahon, Dawson, Akintunde (Chapell 46). Subs not used: Lynch, Waters, Crawford. I expect if you scroll through these pages, you’ll find many instances of me reporting the proverbial “game of two halves”. Well, this time I really mean it! Chester fans arrived for this game more in hope than expectation, with Aldershot being unbeaten at home all season and much of last season as well. Meanwhile the Blues hadn’t notched up three points since they visited Torquay on April Fools’ Day and were missing three injured strikers. The first half of the game went to form in the glorious sunshine, with Aldershot hitting the woodwork three times and Chester not encroaching once into their opponents’ box. It was no surprise when the home side went ahead on the 34th minute. Lively teenage midfielder Jim Kellerman laid on a good pass to Matt McClure and he had no trouble slotting the ball past fellow Northern Ireland u-21 international, Conor Mitchell. Lone Chester striker James Akintunde looked to have picked up an injury in the first half and it was no surprise to see him replaced for the second 45. Replacement Jordan Chapell went on to have one of his better performances and anonymous Liam Davies was also replaced at half-time by Wade Joyce. Chester seemed a changed side right from the re-start and a Wade Joyce corner led to them netting an equaliser. The corner came to Craig Mahon, who was fouled in the box. The resultant penalty was well-taken by Lucas Dawson to put the visitors back on level terms. Aldershot pressed forward, but Mitchell had the better of each shot. Chester had their own strike of the crossbar with 10 minutes’ remaining, giving the travelling 118 fans a vision of an unlikely three points. Sure enough, the ball fell well for the Blues, and a pass from Chapell to Kingsley James saw him score a remarkable 82nd minute winner. If only the team could bottle the feeling of that second half and take it to the Deva Stadium with them. Chester: Mitchell, Halls, Rowe-Turner, Astles, McCombe, Turnbull, James, Mahon, Dawson, Hannah (Chapell 23), Akintunde. Subs not used: Lynch, Davies, Waters, Joyce. Sutton United: Butler, Thomas, John, Collins, Davis (Emmanuel 79), Eastmond, Bailey, Spence, Wright (Cadogan 79), Dundas (Taylor 66), Lafayette. Subs not used: Amankwaah, Jeffrey. A last minute goal from the visitors denied Chester a point after they had come back from conceding two first half goals. There was less than five minutes on the clock before Sutton opened the scoring as Craig Dundas broke down the right with pace before crossing for Louis John to beat Conor Mitchell from the edge of the box. It was one-way traffic as Sutton continued to press Chester down the wings with the home side pegged back and defending deep. Chester were forced into a change midway through the half with Ross Hannah limping off with a hamstring problem to be replaced by Jordan Chapell. 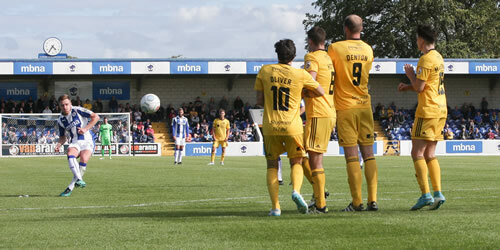 Sutton continued to press as Tommy Wright dragged a shot wide of the target from a good opening. As half-time approached Sutton doubled their lead, Wright latched onto a through ball, advanced on goal before shooting past Mitchell at the near post. Just before the break Chester grabbed a lifeline as Ryan Astles saw a header from a corner blocked with the ball falling to Craig Mahon who controlled the ball before sending a 20-yarder past the diving Jamie Butler into the corner of the net. Five minutes after the restart Sutton had the ball in the net again but Nicky Bailey's spectacular 30-yard effort was ruled out as the linesman deemed it had been touched in on the way by an offside player. Chester were spurred into action as James Akintunde's cross was met by Kingsley James who steered his effort just wide of goal. Just after the hour mark Chester did draw level. A smart move involving Lathaniel Rowe-Turner and James set up Lucas Dawson who found the bottom corner of the net from 20 yards out. Chester, looking for their first home win since November, pressed for an unlikely winner with Rowe-Turner doing well to create some space before firing a shot wide of goal on 80 minutes. With the game entering three minutes of added time Sutton grabbed the winning goal as substitute Kieran Cadogan latched onto a through ball before lobbing over Mitchell. Hartlepool United: Loach, Magnay, Laing, Harrison, Adams (Donnelly 46), Donaldson, Featherstone (Rodney 90), Newton, Deverdics (Munns 65), Cassidy, Amond. Subs not used: Woods, Hawkins. Chester: Mitchell, Halls, Rowe-Turner, Astles, McCombe, Mahon (Joyce 83), Dawson, James, Turnbull, Hannah (White 63), Akintunde (Chapell 72). Subs not used: Lynch, Davies. Chester came away from Victoria Park with a hard earned point after being under pressure for long periods from a home side that hit the woodwork on three occasions. Manager Jon McCarthy brought in James Akintunde to partner Ross Hannah up front with Harry White dropping to the bench, and it was Akintunde who gave Chester the perfect start with a goal in the opening minute. Scott Harrison’s attempt at a back pass fell well short of Scott Loach in the home goal and was intercepted by Hannah, the striker saw his shot partially saved but Akintunde was on hand to slam home the rebound. Pool struck back immediately with Ryan Donaldson forcing a double save from Conor Mitchell in the blues goal. Chester through they's added a second goal as Hannah turned to fire home from a Paul Turnbull flick on only for the effort to be ruled out for offside. Chester had Lathaniel Rowe-Turner to thank for a last ditch tackle that denied Ryan Donaldson midway through the half. Moments later Nicky Deverdics hit the crossbar with Jake Cassidy putting the rebound wide as the home side continued to press. 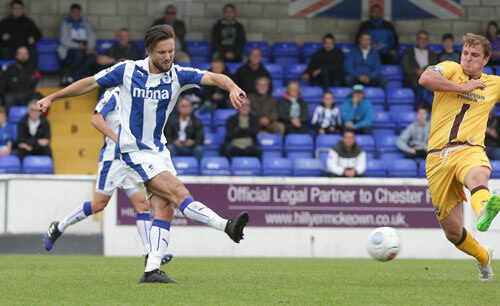 Deverdics hit the crossbar again with an effort from 20 yards as Chester’s goal led a charmed life as the half wore on. 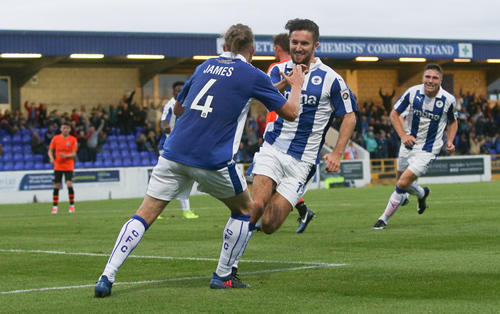 Lucas Dawson saw an effort saved early in the second period as Chester looked to grab a second but it was the home side who came closest to scoring as full back Carl Magnay saw an effort rattle the woodwork before rebounding out to safety. The home side eventually found an equaliser on 71 minutes. Magnay crossed deep into the box and Cassidy and Mitchell both went for the ball with the former Airbus striker winning the contest. Hartlepool now pushed for the winner and Mitchell denied Conor Newton’s shot from the edge of the box but the Blues defence held out for a third successive draw. Chester: Mitchell, Halls, Rowe-Turner, McCombe, Astles, Mahon (Chapell 79), James, Turnbull, Dawson, Hannah, White (Akintunde 68). Subs not used: Lynch, Davies, Joyce. FC Halifax Town: Johnson, Wilde, Brown, Garner, Kosylo (MacDonald 56), Hotte, Denton, Oliver, Dixon (Morgan 73), Duckworth (McManus 46), Charles. Subs not used: Nicholson, Tomlinson. Chester’s second home match of the season was against another of the newly promoted teams FC Halifax Town, both teams had to be content with a point following a lacklustre bore draw. Manager Jon McCarthy made one change from Saturday’s starting X1 with Ross Hannah coming in for James Akintunde who dropped to the bench. The Shaymen had the first of the few opportunities in the game as Bohan Dixon, an ex-trialist with Chester, shot wide from outside the box, not troubling Conor Mitchell in the home goal. At the other end, Hannah put through by Kingsley James dragged an effort wide when through on goal. Mitchell came out to claim a Matty Kosylo effort and Ryan Astles was well placed to clear a Denton header off the line at the back post. Chester's last effort of the half as Harry White won a free-kick just outside the area though Hannah curled the effort over the bar. John McCombe ensured the sides went in level after his last ditch tackle prevented Nathan Hotte a run through on goal. Chester started the second half well as Hannah found Andy Halls whose shot went just wide. On 60 minutes Halifax substitute MacDonald beat Rowe-Turner and saw his cross evade Mitchell and bounce back from the crossbar. McCombe saw a flick header from a free-kick drift just wide as both sides looked for a late winner. Dion Charles went close two minutes form time as his shot on goal was deflected over, and as the game entered the final minute Akintunde linked up well with Hannah before seeing his shot on target tipped round the post by Sam Johnson in the Halifax goal. Chester: Mitchell, Halls, Rowe-Turner, Astles, McCombe, James, Turnbull, Dawson, Mahon (Chapell 82), White (Bell 72), Akintunde (Hannah 64). Subs not used: Lynch, Davies. AFC Fylde: Taylor, Montrose, Francis-Angol, Langley, Tunnicliffe, Bond, Finley, Rowe (Hardy 82), Muldoon, Smith, Jones. Subs not used: Lynch, Grand, Blinkhorn, Ezwele. Chester got their season underway belatedly as they entertained newly promoted AFC Fylde. Their paths had crossed previously as City had risen through the leagues. Now, six years later, Fylde had risen themselves and came to the Deva having won the National League North convincingly last season. The visitors’ tangerine away kit perhaps belied the affection of chairman David Heythornthwaite for neighbours Blackpool. The Coasters attacked the Harry Mac End and moved the ball around slickly from the back. The huge figure of Lewis Montrose, a summer signing from Stockport where he was twice player of the season, orchestrated play in front of the back four. The first chance fell to the visitors as a long throw was headed out towards the edge of the area and Sam Finley volleyed it back on to the roof of the net. Chester responded in a game played at a fast pace and of high quality. Akintunde was looking lively and flicked a shot wide of the post and also beat two defenders with a swift turn and sent a dangerous ball across the face of the goal. His striking partner Harry White latched on to a through ball and, holding off a defender’s challenge dragged a shot out from under his feet which Taylor did well to parry. Akintunde’s close control and movement were causing problems for Fylde and Langley saw a yellow card for demolishing the City forward from behind. The game continued to ebb and flow with the Coasters probing down the flanks and moving the ball around swiftly to create space. From one such counter attack Muldoon sped down the left and rolled the ball across for Smith whose shot just eluded the far post with Rowe-Turner tying himself in knots on the line attempting to clear it. The growing threat from Fylde’s pace was creating nervousness on the home end and soon the plaintive cries of the North Terrace posties of “Sort it out!” and “Get is sorted!” were to be heard. But following another lighting quick break, Jones fed the ball to Finley on the right and his controlled pass was met by Muldoon to file the ball into the net from just outside the six yard box. The timing of the goal was a psychological blow just before the half-time break but it was negated almost immediately as Kingsley James carried the ball forward on the left, played a one-two with White and then rolled it into the path of Dawson who stroked home the equaliser. Soon after the break Harry White dragged the ball back to bemuse two defenders and then curled a shot narrowly wide of the far upright. It would have been a beauty and fitting reward for the forward who was a thorn in Fylde’s defence all night. The Tangerines then dominated for a spell and City struggled to get a toe on the ball. Jon McCarthy freshened up the forward line with first Ross Hannah – who received a rapturous welcome - and then Nyal Bell replacing Akintunde and White respectively. The withdrawn forwards both received standing ovations from the impressed home faithful. Hannah tried his luck from long distance when he saw Taylor off his line and was clearly fired up for the occasion. At the other end Conor Mitchell, signed on loan from Burnley just a couple of hours before kick-off, having impressed in pre-season friendlies, tipped a venomous shot from Finley at full stretch round the post. The game opened up into a grand stand finish as Chapell came on to thread a clever pass through to Hannah who rounded Taylor but found the angle too tight to steer the ball into the net. Francis-Angol was cautioned for pulling down Hannah when the Blues forward was racing clear. From the resultant free kick, Bell went agonisingly close to nudging the ball over the line. Chapell then was given an opportunity to bear down on goal when Taylor miskicked under pressure but he took one touch too many and was closed down. Fylde too pressed for a winner but found City’s defence resilient. It had been an absorbing encounter with much to encourage the supporters of both teams and a draw probably a fair result.